It’s not as quick as whip up a crepe but it isn’t rocket science either. It takes time and passion but homemade always tastes better. 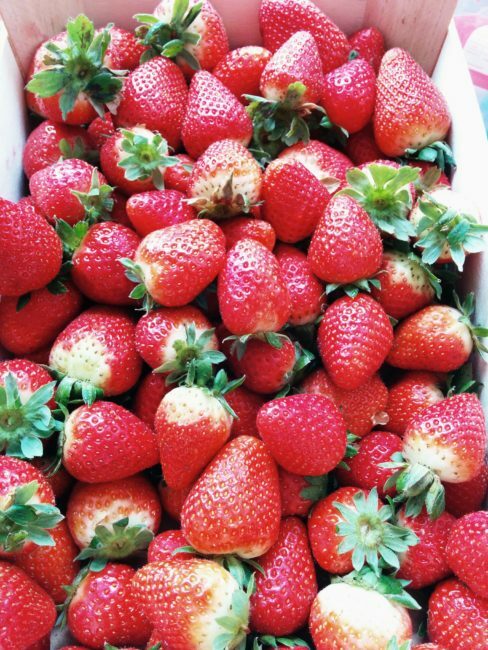 So what can one do when stumbles upon a strawberry sales while doing the weekly shopping? The bad things about sales that are by design irresistible. Then we end up boxes of things that we can’t really do anything before they go bad before we could use them for anything. I clever thing would be not to stock up on short lasting fruits and vegetables but we aren’t always as clever as it would be necessary to come over our instincts. But seriously who could afford walking by an isle full of deliciously smelling strawberries without buying at least two boxes of them. The sad thing is that it doesn’t matter how big the boxes are. So this is how some of us winding up with way too much of short life span fruits. But there is no reason feeling bad about them just yet. They won’t go to waste after all. 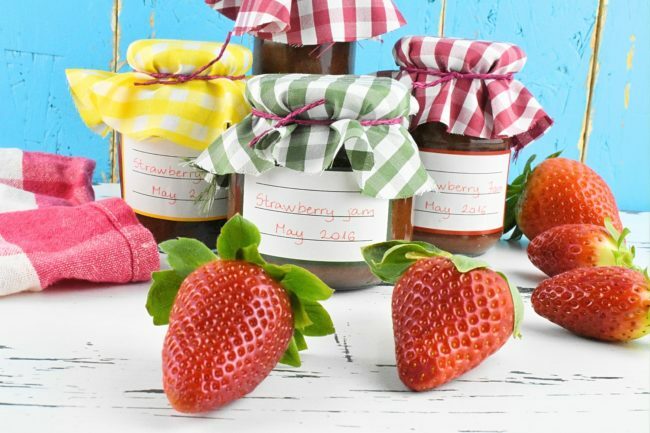 It’s time to make some jam that can be used in our sugar free recipes in so many ways. The only thing that could rein us back on this project is time. Jam needs time. Plenty of time. However we can do things here and there but and occasional stirring of the pot is essential part of the process. 1. Use a big saucepan to cook strawberries. 2. Wash strawberries, cut the leaves off the top, chop them into halves or smaller pieces before putting all of them in the saucepan followed by the honey. 3. Increase heat, stir mixture occasionally. The strawberries start liquefying slowly. 4. Add the stevia leaves. These green leaves might look strange in the jam but don’t worry, it will taste fab at the end. 5. Mix and cook for another half an hour until it all starts coming together as syrup consistency. Don’t forget to stir occasionally. 6. In the meantime clean and sterilize jam jars and their lids. Wash and rinse them first. Then put them in a big saucepan of water and boil them for 15 minutes. 7. Dry jars with a clean tea-towel to get them ready for the cooked jam. 8.Close the lid tightly and turn jar upside-down for about 5 minutes. Let it settle before turning it back. 9. Turn jars back straight up and wrap them into tea-towels one by one to keep them warm. Tuck them in a warm blanket and leave strawberry jam to cool down there for the next 24 hours. Before placing them in the fridge. Maybe it sounds a bit strange but this is a crucial step otherwise the jam will go off sooner than it should. 10. Put the freshly made homemade strawberry jam in the fridge. As it doesn’t contain any preservatives nor much sugar -due to the strawberries low sugar content- it will go bad fairly quickly. So hurry up bake some sugar free dessert while it lasts or just put them in some plain natural yogurt to enjoy. 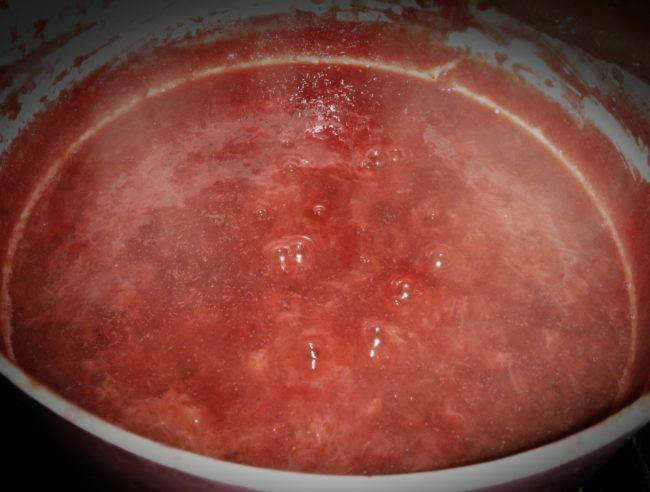 So it might sounds like a long process but it is worth dedicating the time making strawberry jam for a lot of reasons. We’ll know that’s healthy without any sugar or artificial preservatives. It’s delicious, it’s not difficult to make and we can proudly present our own homemade jam for any guests coming for tea. Enjoy it for breakfast with some croissant or just have a spoonful without any reason. Strawberries aren’t the only one to make a tasty jam there is low sugar apricot jam recipe too. Check out the science behind canning in the KnowledgeBase. Use the biggest saucepan to cook strawberries. Wash strawberries, cut the leaves off the top, chop them into halves or smaller pieces before putting all of them in the saucepan followed by the honey. Increase heat, stir mixture occasionally. 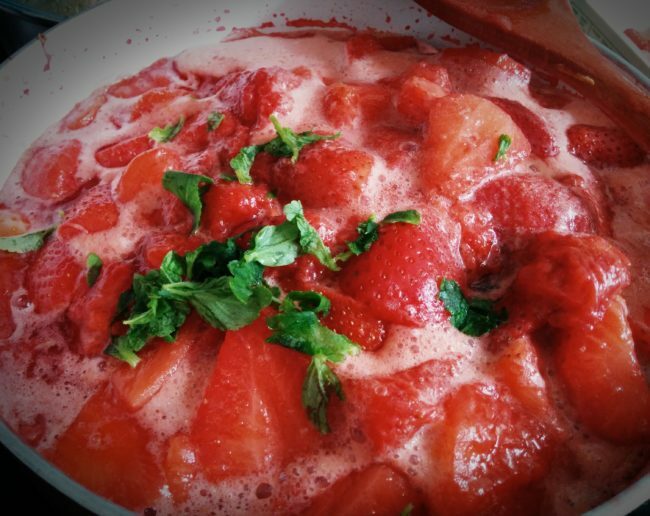 The strawberries start liquefying slowly. Add the stevia leaves. These green leaves might look strange in the jam but don’t worry, it will taste fab at the end. Mix and cook for another half an hour until it all starts coming together as syrup consistency. Don’t forget to stir occasionally. In the meantime clean and sterilise jam jars and their lids. Wash and rinse them first. Then put them in a big saucepan of water and boil them for 15 minutes. Dry jars with a clean tea-towel to get them ready for the cooked jam. Close the lid tightly and turn jar upside-down for about 5 minutes. Let strawberry jam settle before turning it back. Turn jars back straight up and wrap them into tea-towels one by one to keep them warm. Tuck them in a warm blanket and leave strawberry jam to cool down there for the next 24 hours. Before placing them in the fridge. Maybe it sounds a bit strange but this is a crucial step otherwise the strawberry jam will go off quicker than it should. Put them in the fridge. Enjoy having them with different desserts such as crepes or yogurts that we can use our delicious, healthy, homemade strawberry jam. Have you tried making jam with dates instead of stevia and honey? They tend to have a much longer shelf life. They have indeed. Stevia doesn’t work for long term canning as it has zero sugar but honey does work well so does fig and dates.